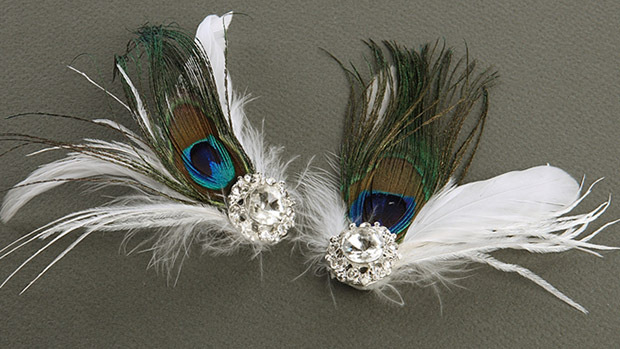 * Mariell's wedding, prom or special occasion shoe clips are handmade in the USA with brilliant Peacock feather plumes & delicate White Marabou. * Our 4" h x 2 1/2" w shoe clips have sparkling crystal accents & will transform any shoes into couture footwear. * Our feather shoe clips can be worn on the front of the shoes, clipped along the sides or placed on the back of the shoes above the heels. * These versatile shoe clips can also be used to adorn scarves, purses or evening wraps!